“For 30 years I have been involved in the procurement of sub-contract services including machining. Since I discovered Thomas Brown’s several years ago they have become my go to machining company especially when quality and precision is paramount and where the complexity/intricacy of the product demands the very best in machinery and technical capability. What also impresses is the support and knowledge of the team at Thomas Browns, not only of machining but also of materials, heat treatment, finishes, anodising, powder coating etc. and their willingness to include these as part of their scope of supply. Finally their well equipped in house QC that includes a co-ordinate measuring machines ensure a confidence that the final product is exactly what was ordered. “Over many years our company has dealt with Thomas Brown Engineering and one thing that you can count on is that rare factor – reliability. 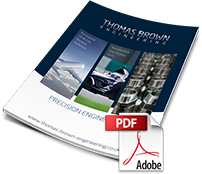 “I am more than happy to use Thomas Brown Engineering for sub-contract machining as I always receive prompt feedback from Rowland Eccles when quoting enquiries and am very satisfied with the quality of goods and the on time delivery performance that we receive.